Centre for young writers supporting children and young people from culturally and linguistically diverse and marginalised backgrounds. 100 Story Building supports the development of their literacy, confidence and sense of belonging, they help foster their creative voice and providing opportunities to have their ideas shared and respected. Raising $21,300 at TFN’s Melbourne giving event in June 2014 (including $10,650 in matched funding from Creative Partnerships Australia), 100SB has financed a showcase of emerging literary talent. Equally, 100SB is not just a centre for young writers – it is the threshold to social inclusion and a place to belong, regardless of economic circumstances, culture or linguistic background. 100SB invites children and young people from diverse backgrounds to join a respectful and inclusive environment in which they can practice and share their ideas around creative literacy. Since the pitch, its Early Harvest after-school program convened an editorial board of upper-primary students from Melbourne’s west and provided them with coaching and workshops to publish a third issue in the Early Harvest journal series. Mentored by creative and publishing professionals, nine students from 4 primary schools set about inviting submissions, selecting authors, creating illustration briefs, commissioning artists and editing content to produce Issue 3 (2014) – a project which attracted a record number of submissions from more than 100 young writers. Featuring a selection of stories and poems, plus a very special Andy Griffiths/ Terry Denton treehouse mystery, Issue 3 appeals to readers aged 10 years+. Revenue from magazine sales was used to supplement seed funding for publishing of further issues. 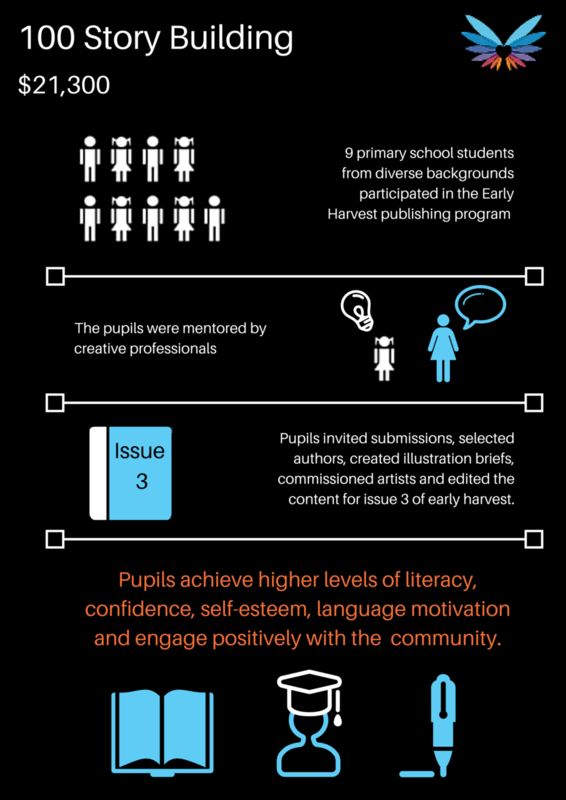 Through extra-curricular arts-rich education, 100SB’s emerging authors and editors achieve higher levels of literacy, confidence and self-esteem while developing the language, motivation and social cues for positive community engagement. Feedback and reflections from participants and stakeholders play a key role in 100SB’s evaluation methodology: alumni students are returning to mentor successive young editors and the anecdotal signals from those involved in the program and their families indicate that Early Harvest is achieving positive outcomes in terms of literary interest and creative confidence. Learn more about 100 Story Building.